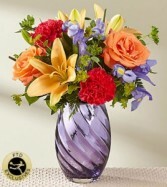 Keepsake lavender glass vase with a silver metallic finish and a swirling design pattern valued at $15.50 included in price. 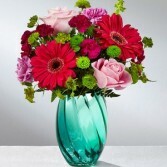 Keepsake aqua blue glass vase with swirling design valued at $15.50 included in price. 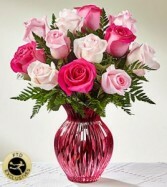 Keepsake berry pink glass vase valued at $13.25 included in price.